SILVERTHORNE – A tiny slip of paper attached to a beam inside Alpine Earth Center reads: Be the change you wish to see in the world. Alpine Earth Center owner Jon Harrington’s desire to reduce his carbon footprint embodies this statement – he’s turned Alpine Gardens into a meeting ground for green energy installation and education, complete with a coffee shop. Harrington’s taken years of passion for sustainable building practices and grown his 28-year-old landscaping and garden business into Alpine Solar Design, a company that formed in February to do solar panel installations in Summit County and beyond. He’s also made changes to his landscaping practices, such as using organic fertilizers and building waterfalls using solar panels. Plans are in the works to convert his green houses to solar heat for his custom growing services in springtime. Harrington puts on free, hour-long “green” clinics every Tuesdays at 9 a.m. – this week he gave a talk on solar power, including rebates and solar tax credits. 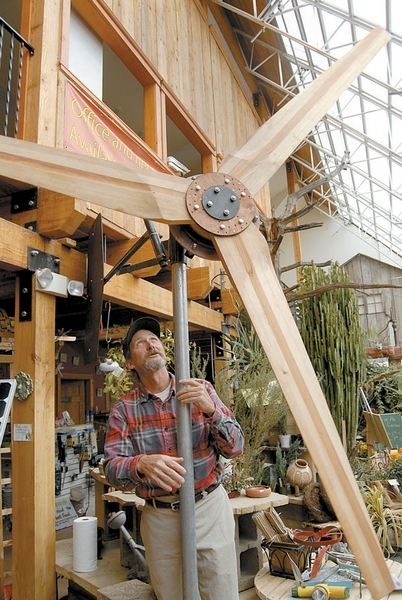 Next week he’ll talk about his recent experience building a 10-foot, 48-volt wind turbine at a sustainable living fair in Fort Collins over two days. The wind generator is currently set up inside his business and can be viewed upon entrance. The Alpine Earth Center owner is additionally working to put together a stream of winter workshops to educate locals and visitors about green technology. He’ll be featuring topics like straw-bale construction, natural plaster, natural paints, overall sustainable business practices and how to build a wind turbine. Free Tuesday talks will continue through winter, and the workshops will have a cost. Harrington said he sees his solar power installation business and educational workshops as a service to the community, and he’s leading by example – he just completed his own active solar panel installation on the outside of his business, and it’s providing 85 percent of the power used in the Alpine Earth Center building. Harrington noted that his business has been running on passive solar energy for 14 years, but solar panels on his roof is upping the ante – he’s working on putting radiant floor heating in, too. Plans for a new business sign incorporating low voltage LED lights powered by photovoltaic panels is also in the works. Harrington also said he’s building his own solar home 10 miles north of Silverthorne, incorporating straw-bale construction and natural materials, like pine-beetle killed timber. For more information, call the Alpine Earth Center at (970) 468-8189 or visit http://www.alpineearthcenter.com.